Cassie had her crucifix soldier, Ringer has her chess soldier. What would you do with it in the apocalypse? Would you fight if you have a soldier? 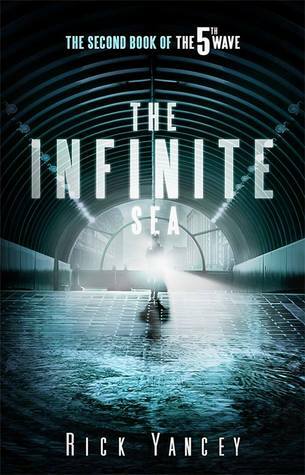 I really enjoyed The 5th Wave and anxious to read The Infinite Sea by Rick Yancey and he did not disappoint. I loved this book as much as I did the earlier book in this series. Again it was an “on the edge of your seat” fast paced story. This time from mostly Ringer’s and Zombie’s POV. I loved this twist and it really made me understand these characters better, the things that were questions in the first book became knowledge in this one and it keeps it interesting. At first glance I thought I was still reading from Cassie’s POV when I started this book. It was mostly because I was not paying attention and expected it be told from her point of view. So when I heard the main character talking about Sullivan I got confused, quickly deducting it could not be Cassie, because it was about a female and it is her last name (her little brother is Nugget to all the kids from Camp Haven). When I actually found out it was told from Ringers POV I was so happy! I liked the character already in the last book, but there was not much know about her and she had sparked my interest. Ringer IS the interesting person I thought she was. She liked chess, but does not mind it when a soldier changes the game into a game that also involves baseball. It is interesting to see how she interacts with the soldier and Colonel Vosch, but also who she was before the first wave. The same goes for Poundcake, you only get to know a little about him, but it completely makes sense how he acts in the books if you know where is coming from. I found that so interesting and was sad to see him lose his live, although it was noble. I was really amazed with how the story between Ringer and her soldier play out. I had not seen it coming and I usually do. Also more of the background of The Others is told and I am really curious what is going to happen in the next book. Next year The Last Star will be release and I can’t wait for it to come out! I hope you do too. I hope The 5th Wave movie will be a hit success, I am curious to see this book brought to the big screen. This entry was posted in Book Review and tagged Adventure, Book Review, Drama, Dystopia, Fantasy, Rick Yancey, Science-Fiction. Bookmark the permalink.